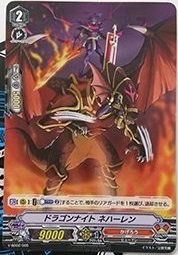 The Japanese card of the day is Dragon Knight Nehalem, from V-Trial Deck 02: Kai Toshiki. AUTO [Rearguard Circle]: When placed, by paying [Counterblast 1], choose 1 of your opponent's rearguards in the back row, retire it, and this unit gets Power +5000 until end of turn. 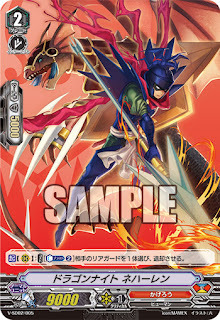 ACT [Rearguard Circle]: [Counterblast 2] Choose 1 of your opponent's rearguards, and retire it. You can see Kitta Izumi employing this older version of Nehalem to devastating effect in this official video of the Start Decks, where she takes advantage of it being repeatable to retire two of Morishima Shuuta's rearguards in one turn. Both versions of the card will be legal in Standard format, so which do we go with? 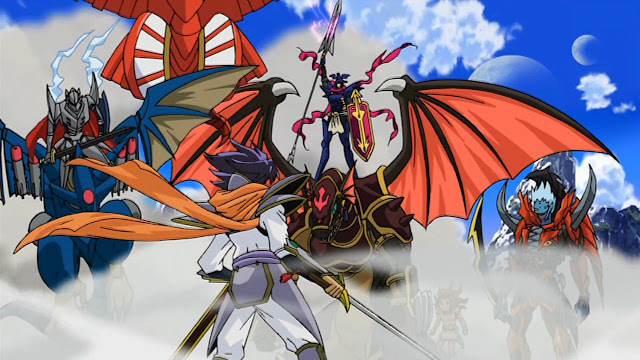 Early playtesting showed Nehalem to be the primary reason to run Kagerо̄ over Royal Paladin, just as his counterpart Jarron was the reason to play Royals, but the Dragon Knight was held back by his 9k base. With 10k being the new standard for grade 2s, this incarnation of the card was wholly dependent on Gojo to meet the 18k+ baseline of the Standard format. What Nehalem can do is take out Marron, crushing one of the sources of Royal Paladin's long-term card advantage. For that alone the card is probably going to be a staple, and being able to stop Blaster columns from reaching 23k by hitting Wingal is likewise welcome in the deck. If you do want to make use of the old Nehalem to go after Jarron, you can try to either split your Nehalems 2-2 or simply tech the old card outright. Since the Start Deck Nehalem's skill is an Activated ability, you don't have to use it the moment you put the unit down, so old Nehalem doesn't actively hurt you beyond being a 9k base and needing Gojo's boost to function offensively. Is this a wound to consistency? You're still getting access to a retire skill from this tech Nehalem, but introducing variance in the form of your retire sometimes reaching the front row and costing more. 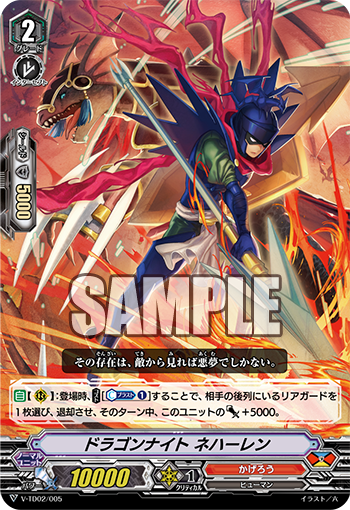 You could easily skip the trouble and run the deck without the SD02 print, and certainly Dragonic Overlord is designed with the idea in mind that you're swinging at front row units late game and retiring back row units. While I personally favor not running the Start Deck version due to Spillover being able to hit virtually anything of importance, I recommend putting the options you have on the table to the test so you can make a truly informed decision when tournament time comes. A Dragon Knight of the Empire that wields a huge spear endowed with lightning. They are said to have the power of a hundred soldiers. Alongside the dragon that could be called their second self, they soar across many battlefields. Dragon Knight Nehalem is illustrated by Roku. The previous Japanese card of the day was Miru Biru. The first Trial Decks of the Standard format, V-TD01: Sendou Aichi and V-TD02: Kai Toshiki, will launch in Japanese May 11th, 2018, and in English June 8th, 2018. They will be accompanied by a new sleeve based on the "Imaginary Gift" design. The first Booster Set of Standard, V-BT01: UNITE! TEAM Q4 will launch in Japan May 25th, 2018, and in English June 22nd, 2018. The first Extra Booster set, V-EB01: The Destructive Roar will launch in Japan June 29th, 2018, and in July for the English-speaking world. The accompanying new anime series, codenamed "Origin," will begin airing May 5th, 2018, on TV Tokyo and affiliated stations. It will be simulcast with English subtitles on YouTube and Crunchyroll.